So the first book I read for Venice in February was a bit of a disappointment. I had high hopes for it too, since I very much enjoyed Newmark's later novel, The Sandalwood Tree. 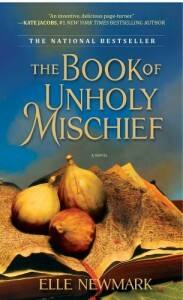 The Book Of Unholy Mischief tells the story of Luciano, a street thief who is lucky enough to become the apprentice to a top chef in Venice in 1498, just as it is being swept up in mania over a mysterious book, that apparently contains a formula for eternal life as well as the secrets of alchemy. But why has he been chosen above so many others?To focus first on what I did like about this novel, I was pleasantly surprised at how in-depth the culinary theme was. As someone who likes cooking, I enjoyed reading about all the different dishes the chefs prepared and how the busy kitchen worked. I also liked that the mystery was in some way tied to cooking and cook books (without giving anything away), as this seemed a novel approach. Some of the dishes sounded absolutely delicious too.The description of Venice itself was very evocative. Newmark's Venice is one of secret corners, torture dungeons, dark alleyways and silently moving gondolas. I could easily imagine the maze of streets and was transported back to the vision of Venice Newmark created;"Over that bridge, the Cappa Nere conducted criminals and heretics to dark underwater caves where the poor wretches lay chained in dank cells listening to the plash of oars as gondolas passed freely overhead." p66.Despite this positive aspects of the book, it had two fundamental problems. The first was the lack of connection I felt with the characters and events of the story. The main character, Luciano, was a bit of an everyman and the cast of secondary characters were indistinct from each other to the point where it was hard for me to keep them apart in my mind. The only characters that were memorable were the chef, and the main villain of the piece. This disconnect meant that it was a struggle for me to get through this book - it took me a week to read it, unheard of for a book I am enjoying.The other problem was the mystery itself. There was so much build up in the initial stages of the novel about what might be contained in the mysterious book (eternal life? alchemy? ), that when the secret was revealed, I couldn't help but be a bit let down. There also wasn't that frantic pace towards the end that I associate with a good mystery or thriller, everything moved much too slowly.For me, these two problems were much larger than the other, positive aspects of the book. I can appreciate that it was well written and that the historical setting was very vivid, I just didn't enjoy reading it. One I am glad I borrowed from the library rather than purchased.